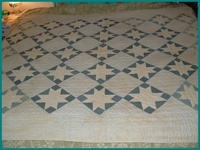 I've always been intimidated by quilting, but at the same time, really drawn to it. 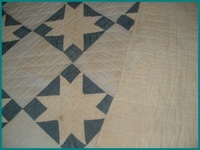 One of my grandmothers-- a seamstress-- made many many quilts for all of us, but they weren't exactly my "style" (it was the 80's, there was no style anyway. Ha!). In high school, I helped her make my quilt, which I found to be so tedious--the endless cutting, the small small pieces, etc. 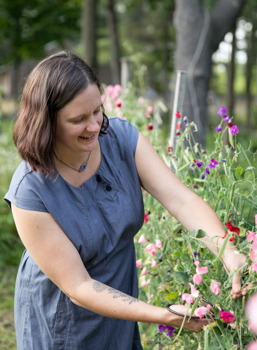 But I do appreciate her work so much more now, and am so grateful to have several that she made for us. And then years later, I discovered a few antique quilts, and like all things old and textile-- I fell in love (um yeah, let's not get into the ridiculousness of my vintage apron or handkerchief "collections!"). Lately I've been (literally) dreaming about doing the hand stitching that I see on some of these old quilts....and I know the time is coming soon when I can resist it no longer! 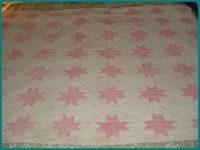 And here's my favorite "little" quilt.....my great grandmother made it for my grandmothers doll bed. I love looking at all the fabric, particularly knowing that for something like this (and being very poor in rural Maine during the Depression), all the fabric must have come from old clothing in the family. 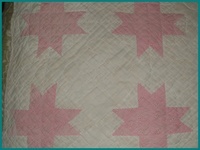 I feel so connected to my past when looking at this simple quilt. The time that went into making a quilt for a doll for one of 5 children, when there must have been so many other things to be done....it seems like such a beautiful, timeless act of Mama Love.